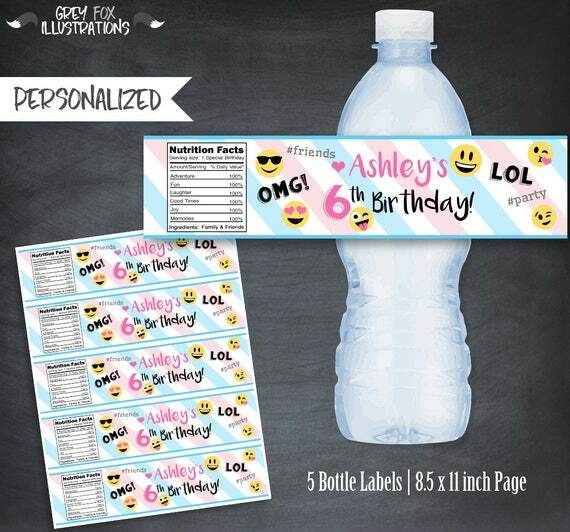 PERSONALIZED BOTTLE LABELS - Label will be personalized, with your child's name and age. Please keep in mind, this is a printable water bottle label, you will not receive physical water bottle labels in the mail. You will receive 1 HIGH RESOLUTION 300dpi JPG Digital File in a format of 8.5 x 11 inch letter size page. ★ On the page there will be 5 water bottle labels, one design. Just like the ones pictured above, you may print as many as you need at home. Each bottle label measure 8 x 2 inches. Will work with most brands, please measure your bottles first. These labels only come in one size. ★ Delivery of your personalized bottle labels will arrive, via e-mail listed on your Etsy account. Please check FAQ's or announcement on main page for turnaround times. "Grey Fox Illustrations" items are for your personal use only, and may not be used commercially or resold. By ordering you agree to shops terms and conditions. Due to the customization of this item, no refunds are provided. All designs are created by Grey Fox Illustrations. All characters and images used are copy-written by their respective holders and are not being sold. This is not a licensed product. Purchase is for creative services only, which include my time and effort used to create or personalize your item.